Blide Landscape has been creating natural, artistic, and hardy landscapes in the Truckee area for over 15 years. Our mission is to help homeowners and contractors fully realize the aesthetic potential of their mountain environment by creating outdoor spaces to compliment a home’s design. We help guide our clients from concept to completion on projects large and small. Tom has lived in the Truckee-Tahoe area since 1987, and has been creating alpine landscapes for over 15 years (although he likes to say that he has been playing in the dirt for over 50 years). He started his business with one of his brothers as Blide Brothers Landscape. Tom thought that one day the business might become “Blide and Sons Landscape”, but he had 3 beautiful daughters who refused to trade in their curling irons and makeup for shovels and dirty fingernails. Needless to say, he is very involved in the Truckee community, volunteers his time and materials for local trail and school improvements, and is a member of CATT (the Contractors Association of Truckee-Tahoe). 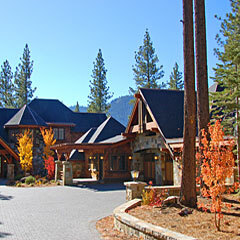 Blide Landscape Construction (BLC) was named “Best Landscape Company” in the Sierra Sun’s 2013 Best of North Tahoe and Truckee poll, and placed as a top runner in the same poll in 2011 and 2012. 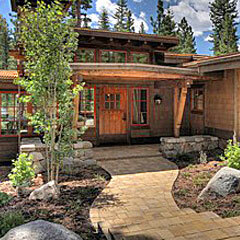 BLC was also awarded “Best Landscape” and “Best Landscape Design” in the 2010 Tahoe Quarterly Best Homes issue. 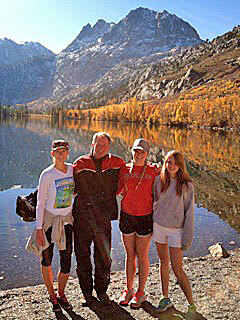 You will find most of Tom’s work in Martis Camp, Lahontan, Northstar, Truckee and Lake Tahoe. 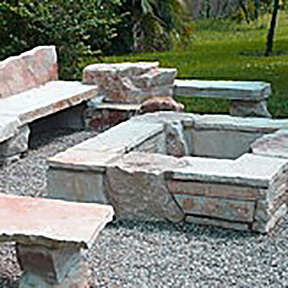 Blide Landscape strives to create outdoor living spaces as unique and inviting as the exquisite interiors they compliment. From the initial meeting with each client and continuing throughout the engagement, Tom seeks to understand the specific look and feel the client is looking for. Many local developments require a native palette, which is BLC’s specialty. BLC also loves to get creative where possible and entertain even the craziest ideas and dreams for their landscape design. However, Tom is also the voice of reason and knows what plants, shrubs, trees and features work (and which do not) in our harsh mountain environment. Tom wants each of his clients to stand in the various spaces of their homes (the kitchen, the living room, the bedroom, etc.) and be drawn outside by the landscape design. He collaborates throughout the project with the architect and builder to ensure the outside spaces are connected to the inside spaces, and that the distinction between the outside and inside spaces is in harmony. Blide Landscape accomplishes this by feeling and viewing the landscape from both outside and inside your home. A successful landscape blends with its native surroundings and makes even a brand new home feel like it has been there for 10 years. Blide Landscape’s creative designs, attention to detail, and quality of workmanship are what sets them apart from other area landscapers. BLC uses only the best contractor grade components for irrigation and hardscape, and the best hardy native nursery stock. They also provide a 2-year warranty on parts, components and workmanship and a limited warranty on plant materials. Large temperature swings, pesky critters, sometimes heavy snow loads, drought and over-caffeinated snowplow drivers are just a few of the obstacles that homeowners have to contend with in order to maintain their landscapes over the years. Blide Landscape provides complete seasonal maintenance services, or one-time Spring start-ups or Fall wraps. Local references and project viewing available - click to request. "Tom worked with us and with our architects to design a wonderful landscape environment for our new home. The vegetation added privacy and softened the scars of construction. His rock work blends into the landscape seamlessly while giving us safe access to all parts of our land. Tom is an artist, his palette the natural world. I highly recommend him." Please feel free to contact us for a consultation. We have completed dozens of projects in Martis Camp, Lahontan and other areas of Truckee and Tahoe, and have developed great working relationships with various design committees, multiple builders and architects across the community. All content copyright © 2019 by Blide Landscape.